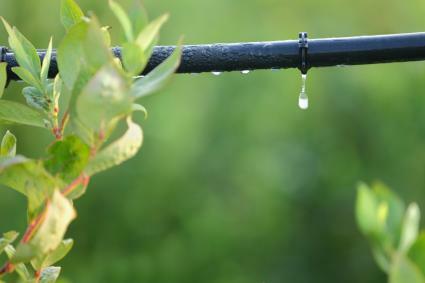 Sprinkler systems take care of watering the landscape so you don't have to. It's a big investment to install one, but having it is like having insurance for your garden. Your sprinkler will keep the garden alive and lush when you go out of town or when you're just too busy to water by hand. According to Irrigation Tutorials, the two main types of sprinkler heads are rotary sprinklers and spray nozzles. The rotary sprinkler head rotates along a set arc to distribute the water. 90-degree nozzles are for corners. 180-degree nozzles go against the flat edges of hardscaping, such as a driveway. 360-degree nozzles are used in the middle of a lawn or other large scale planting. Both types of sprinklers are available in a pop-up format, which means they are hidden below ground when inactive. When the system is turned on, the water pressure forces the sprinklers to rise up and begin sprinkling. Pop-ups are perfect for lawns, but areas with taller vegetation are typically irrigated by a sprinkler mounted on a riser that elevates it just above the vegetation so the spray is not blocked. Also known as a timer box, the controller is the brains behind the sprinkler system. It is typically located in a garage or basement and is programmed to tell the sprinklers when to come on and how long to stay on. There are also devices called rain sensors that signal the controller to forego irrigation when the ground is sufficiently moist from rain. A wire leads from the controller to valves that open and close the pipes that deliver water to the sprinklers. They are typically located in a plastic box just beneath the surface of the soil. Each valve controls a different irrigation zone, which can be programmed independently at the controller. The trickiest part of irrigation design is figuring out how far to space your sprinklers. The key to this is knowing your water pressure, which is easily obtained by using a pressure gauge. Simply screw it onto any hose faucet and turn it on full blast. Water pressure is measured in pounds per square inch (psi). The general rule of thumb is that the water pressure at each sprinkler head should be at least equal to the number of feet it needs to spray (measured as its radius). Thus, if the total water pressure available is 48 psi, each irrigation zone could include six sprinklers with an 8-foot spray, four with a 12-foot spray, three with a 16-foot spray, and so on. Areas of the landscape with similar water needs should be grouped together in a zone. For example, lawns and vegetable gardens require short, frequent irrigation intervals, while shrubs and trees do better with deep, infrequent soakings. Figure out how many and which types of sprinklers are needed for each area, and then draw a schematic of the system on a map of your property to figure out how many of each component is needed. Use the map to mark the best locations to route underground piping and install the valves and sprinklers. If there is not already a valve tied into the main water line feeding the house, it will be necessary to hire a licensed plumber to install one. Once the water is available, run a pipe from this point to the location of the valves. The water supply will need to be split with a 'T' to feed each valve. From there, dig trenches for the PVC piping that will supply water to each sprinkler. The pipe should be buried at least six to eight inches deep, although the pipe depth should be well below the average depth of frost in areas where the ground freezes in winter. Always call 811 before you dig to make sure you know the location of underground utility lines. 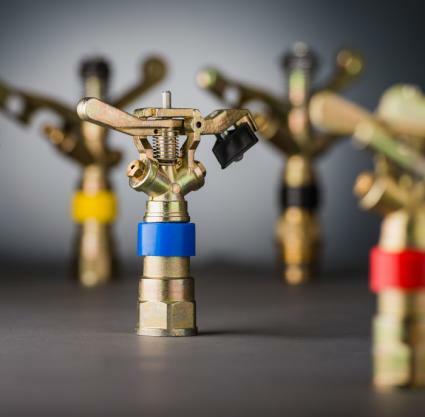 Some of the general variations in sprinkler systems have already been mentioned, but there are special products that make it easier to water certain types of landscaping. Each of the following alternatives can be part of the overall irrigation design, and they are easily integrated on different zones of the same system. 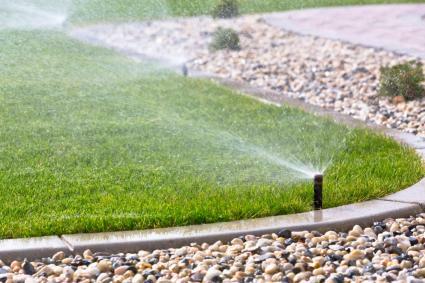 Sprinklers are the only feasible choice for watering large lawn areas, but vegetables, annual flower beds, and perennial borders are easily watered with a drip system. These systems water at ground level precisely where needed, which saves water and keeps the foliage dry to help prevent disease. Tall shrubbery is often watered by bubblers. The bubblers screw onto the same risers as sprinkler heads, and they're used to flood the root system at the base of each plant. A soaker hose is often used to water groundcovers. This looks like an ordinary garden hose, except it is covered with tiny holes that emit water. Rotary sprinklers are the best choice for large areas since they have the greatest spray distance. Regular spray nozzles are more easily adapted to small and irregularly shaped areas. You will have to plan the system carefully to fit with the existing conditions of the yard. 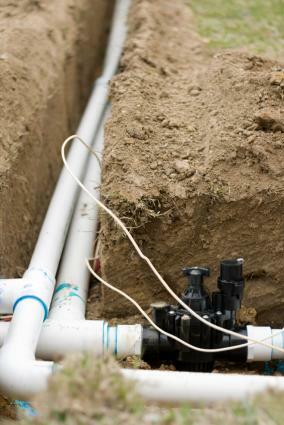 Underground utilities cannot be crossed without hiring a professional to do the job. Driveways, paths and patios are best avoided, although it is possible to burrow under hardscaping with a special tool, if necessary. The key to irrigating on a slope is to run the supply pipes horizontally across it and keep each one on a separate zone. If you have sprinklers or drip emitters at a substantially different elevation on the same zone, the force of gravity will cause an uneven distribution of water, over watering the lower plants and leaving the uphill areas dry. Installing a simple irrigation system for a tiny backyard is a feasible weekend project for the do-it-yourselfer, but larger, more complex installations are best left to a professional. There are generally no permits required for installing residential sprinkler systems. However, a lot things can go wrong, and it's frustrating to work so hard on something and then have to make changes later. If you do attempt to go it alone, use the information here as a starting point and invest in a complete step-by-step manual to serve as a guide.